By Leah King | February 13, 2013. 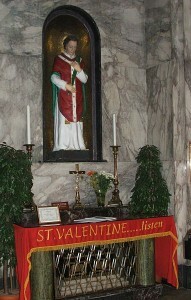 The statue of St. Valentine inside Whitefriar Street Church. Every year, February 14th , better known as St Valentine’s Day, is celebrated worldwide. But what do we really know about St Valentine, whose relics are on display in Whitefriar Street Church? There are many different legends of St Valentine, some say it comes from the pagan fertility festival Lupercalia while others believe it come from Valentine of Rome. The legend of Valentine of Rome comes from a Roman priest who was asked to heal a young girl, called Julia, of blindness. Valentine grew close to Julia but unfortunately he couldn’t heal her, so he was arrested and sentenced to death. The night before his execution, Valentine wrote a farewell letter to Julia, ending it “from your Valentine”.Legends say that when Julia received the letter, her blindness was cured. In the year 496AD, Pope Gelasius made the 14th of February St Valentine’s day, and it has been celebrated as the day of love ever since. On Valentine’s Day every year, the relics in Whitefriar Street Church are moved up to the front of the church to be displayed to spectators. These relics include a vial of what is said to be St. Valentine’s blood, his remains, and artefacts from his life. 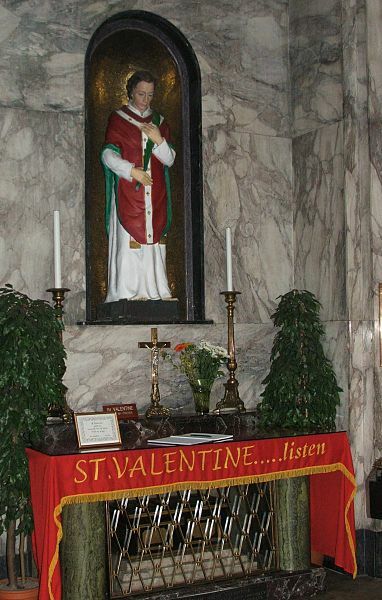 There is a permanent shrine, dedicated to St. Valentine, in the church, where the relics are placed underneath a mosaic of the Saint himself. Saint Valentine’s remains are said to have been brought to Ireland by an Irish Carmelite called John Spratt, in the year 1836, after they were given to him by Pope Gregory XVI. The Church holds a Blessing of the Rings at 11.00am and 3.15pm on Valentine’s Day for those about to married. So if you’re looking to be really romantic this Valentine’s Day, bring your loved one to visit the relic of the Patron Saint of Love.